With Valentine's Day just around the corner, my mind has been flooded with red, pink, and everything girly. Very few fabrics embody the romance that lace possesses; thus making it a Valentine's Day favorite. I love the idea of playing with a mix of pinks as a way to pay tribute to the holiday's mascot without incorporating the standard shades of red. Not to mention, tulle has a way of leaving you feeling extra girly and totally ready to be swept off your feet - don't you think? love your style! This outfit is so cute:)! What a pretty dress. Love how you styled it with that gorgeos blouse and I love your stunning shoes. Wish you a fabulous day Anna. Love this cute and romantic look! Adore that bag. You look gorg. What a fun & girly look! Love the shades of pink for valentine's nod. The skirt is so girly and fun! I was thinking to wearing tulle for Vday too! And these sandals are great with the clear heel! I LOVE that! You look stunning! Such a nice romantic outfit. 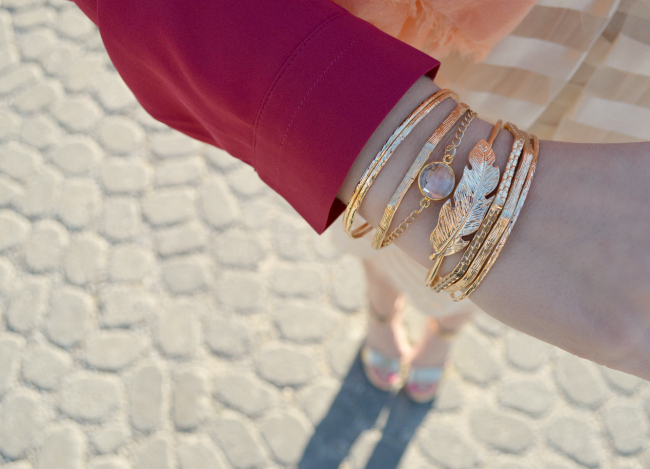 I love the bracelets! One of my favorite looks, Anna. The lace top is darling. The dress is adorable!!! I love your outfit!!! Love love love the bag and sandals! The dress is so cute!! The perfect outfit for Valentine's day. That dress is so beautiful! Girly but very elegant. I'm still crazy in love with those heels of yours! I love the mix of different pinks and the mix of different textures. The color of that blouse is amazing. Thanks for stopping by my blog. I am glad I am not the only one with a fox obsession. The lighting in this picture is so pretty. I want your dress and heels!! Great chunky heel shoes. Love this outfit and the way you mixed the textures. Beautifully done. You called *me* stunning? Girl, you look amazing. I love that you layered this over that berry top! Perfect Valentines day look! Thanks for your sweet comment on my blog. I love my Tibi skirt too, even more so because I snagged it at a recent sample sale for a really low price! Great look here. That dress is beautiful and I love the way you paired the pink blouse under it. I think my favorite thing is your bag though. Love the bow! This is such a pretty look, I love the skirt of your dress and the bow on your handbag is just darling. Your dress is really gorgeous, makes me wish for spring!! I love the metallic shoes with the clear heel! I love that you layered this blouse underneath this lace dress. The whole combination looks beautiful and I'm obsessed with your heels! I love that outfit it is so cute! Adorable outfit, love the lace. I've absolutely fallen in love with your blog Anna! Your story is so inspiring and lovely and I am so pleased to now have met you through Fash Boulevard. Hugs! You look so beautiful! Amazing dress! I love this look! I love the lace layered over the red. I think the whole look is so fabulous from head to toe, love! I ADORE that bag ! Obsessed with the details of this dress. You look stunning. Amazing shades i love pink color thanks. Those shoes are to die. Lovely dress! Those heels are killing! That dress is perfection and I am so jealous of your sunny weather. Enjoy the rest of your week! Pretty look! I love your arm party! PS. Loved the wedding post. Naturally. Oh Ana I am in love with this entire look. So stunning! Those shoes are TDF! That scarf is so pretty and feminine. That dress is amazing! Love it with the pink scarf. I just love the transparent heels of the shoes! I couldn't agree more. 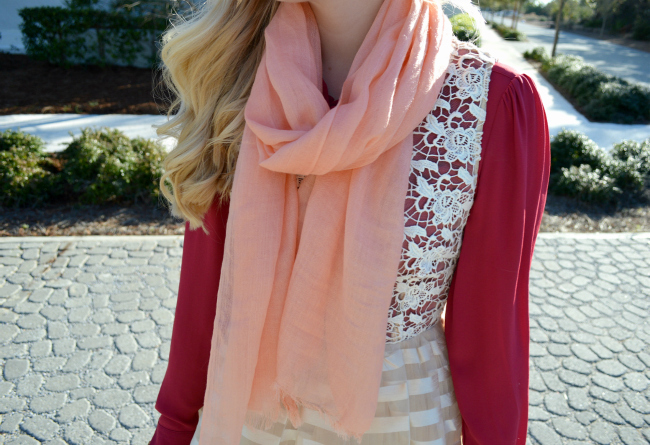 Lace and a variety of pinks is a great way to pay homage to the holiday. ps. dying over those shoes. Oh I just love Valentines Day!! You look so fun a frilly.. pink is such a fun color to wear..
Wow, you look great! I'm loving your style! And those shoes? I die! Love how feminine and girly this outfit is! So perfect for Valentines Day. This whole outfit is ridiculously cute!! Those shoes are seriously killer. Gorgeous! I love those shoes. Simply stunning!!! I totally love the whole look, it's lovely. The bracelets are awesome!! pinned!! I also love the heels...I hadn't considered about getting that style but I'm loving it, I think i'll add it to my wishlist :). Thank you so much for stopping by! I'm your newest follower on GFC and Bloglovin'. Xo, see you around. u look so lovely !!!!! These colors balance each other really well - looks great! Those heels are so chic loving them! Your heels are oh so fabulous! This is so cute and girly, love it! That dress is a must-have, it has a very whimsical vibe to it! Lovely look, so cute and feminine! Love the skirt especially. That dress is so pretty - I love the lace and the stripes together! So elegant! I am absolutely obsessed with the shoes! Great outfit. woowwww i love your look!! Your are soo beautifuul!! Thank you so much for your latest comment on my blog. You've an amazing sense of style. Such a great look ♥. Simply love the dress!